Integrase from prototype foamy virus bound to two short pieces of DNA. The rest of the DNA is shown schematically. Retroviruses, such as HIV, are particularly insidious. Most viruses infect a cell, force it make many new copies of the virus, and then leave when the cell is used up. Retroviruses, however, take a long-term approach to infection. They enter cells and build a DNA copy of their genome. Then, they insert this viral genome into the cell's own DNA. This integrated DNA can be used immediately to build more viruses, or it can stay dormant, waiting for the best time to start virus production. This is one of the many reasons that HIV is so hard to fight: it can lie waiting in these long-lived cells for years. Integrase is the enzyme that splices the viral DNA into a cellular chromosome. Four identical copies of integrase grab the two ends of the viral DNA, creating a stable complex called an intasome. The intasome then binds to the cellular DNA and performs a strand transfer reaction, joining the viral DNA to the cellular DNA. 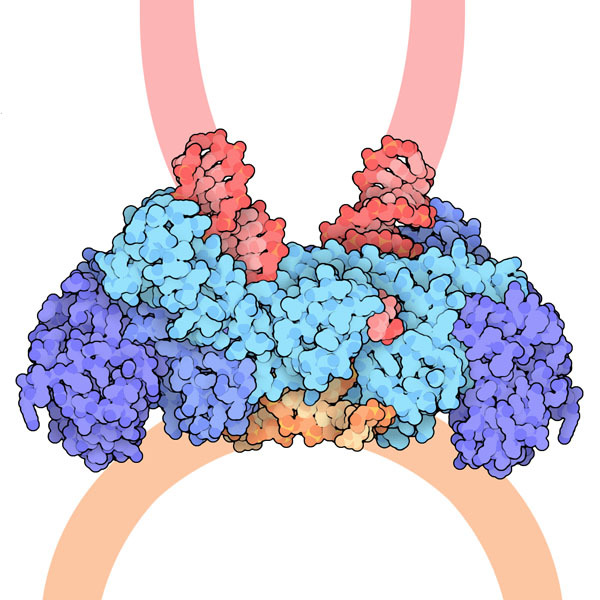 The structure shown here (PDB entry 3os1 ) includes four integrase subunits (in blue) and three short pieces of DNA that correspond to the two viral DNA ends (red) and the cellular DNA (orange). The two integrase subunits at the center (light blue) provide the active sites that cut and join the DNA, and the outer pair of integrate subunits (dark blue) play a structural role. 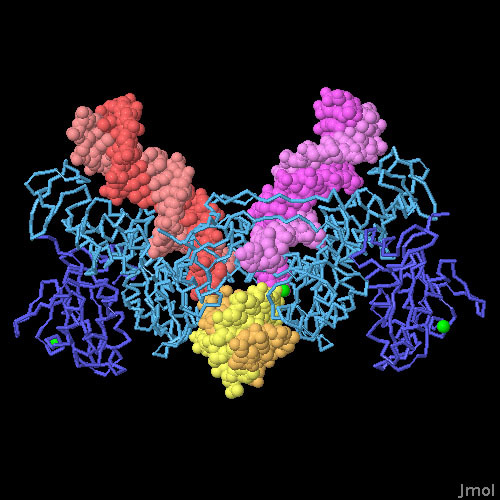 This close-up view of the integrase active site shows the binding of the anti-HIV drug raltegravir, shown in magenta. It binds to the two magnesium ions (in green). 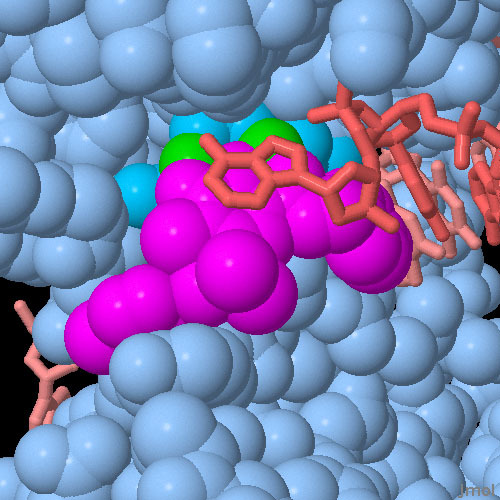 The drug also interacts with the last base of the DNA chain (red), which stacks on top of the drug. Researchers have been studying HIV integrase for years, trying to understand how it works so that they can design drugs to fight AIDS. This work has led to the development of several effective drugs, including raltegravir, which is currently being used to treat HIV infection. So far, it has proven difficult to crystallize full-length HIV integrase and its complexes with DNA. The structures shown here are from a related retrovirus, prototype foamy virus (PFV). Although PFV is harmless, it is very similar to HIV integrase and provides an excellent model for studies of retroviral integration. Structures of PFV integrase with DNA have revealed the critical steps of the integration reaction. Click on the image to explore two structures: the complex just after the intasome captures the target DNA (PDB entry 3os1 ) and the complex after the strand transfer reaction (PDB entry 3os0 ). You can use the Structure Comparison tool to compare the PFV integrase structures with the structures of different domains of HIV integrase. You can explore structures of several inhibitors with PFV and HIV integrase in the PDB. G. N. Maertens, S. Hare and P. Cherepanov (2010) The mechanism of retrovirual integration from X-ray structures of its key intermediates. Nature 468, 326-329. M. Jackolski, J. N. Alexandratos, G. Bujacz and A. Wlodawer (2009) Piecing together the structure or retroviral integrase, and important target in AIDS therapy. FEBS Journal 276, 2926-2946.